We’ve all heard it: In 2012, the Mayan calendar ends, the earth is shifting, massive economic collapse, the Arab spring, and of course, apocalyptic/end of the world predictions. What you might not have heard is that many indigenous cultures see this time in history as the end of one cycle and the beginning of a new one. We, as a society, are at a choice point. We can create a golden age or bring in an age of continued darkness and destruction. I desire the vision of a new golden age. What about you? The veil between human/earth life and what we call “life after death” or the “hereafter” is thinning. People having “near death experiences” come back and report we are all connected, we must learn to love, and we must stop thinking we are all separate from one another. Others, through past life and in-between life regressions, report not only past lives on earth and other planets, but also of being able to see where they go as Spirit in-between those lifetimes. Even more proof of the thinning of the veil is that numerous people are having conversations with people who have passed over. Many report feeling and seeing non-human energies, hearing them, and smelling them. Other people are channeling masters, guides and angels. It is now commonly accepted by millions that we are spiritual beings having a human experience. We come to the earth to learn lessons which are best learned in a place of duality. Some of these lessons are learning to trust ourselves, creating boundaries, learning how to communicate, and learning how to live in integrity. An example of why we chose to live in duality is this: If you came to learn how to create boundaries, you might have to experience abuse and teach yourself how to assert clear boundaries. In experiencing the lack of boundaries, you have to learn that you are in fact worth sticking up for. In other words, every time we “overcome a hardship” or “find our self-value” we incorporate another lesson into our spirit. Our vibration rises and we move forward on our path back to love/God/Universal Oneness. And as each individual does their own work, and expands their own vibration, it spreads out and resonates with others. One by one, we make a difference. With these concepts in mind, time is of the essence. If there is a chance that we who have chosen to be on the earth in this era of transformation are responsible for the direction we take as a human race, then we might want to get serious about our growth. If it is true that what we think, what we create, and the choices or decisions we make have huge consequences for the human race, we must call forth our inner strength and act from a place of integrity and responsibility – not someday, right now! Why take chances? It is imperative to wake up, step up, and be the very best human ambassadors we can be. We can not reach enlightenment without acceptance and learning to release judgment. If a golden age of peace is to come, we need to first stop our inner wars, stop our destructive self-loathing, and learn how to accept, release, forgive, and love ourselves and others. This is the intention of this book. This book is a guide towards learning to accept, release, forgive, and love as we learn to stop the inner wars and destructive self-loathing. This book teaches us that one of the ways we find our way back to love is through the miracle of the gift of forgiveness. By this I mean we need to get back to living from our soul’s intention, rather than living from ego or fear. What I have learned over the years is when you remove the layers of hurt, fear, anger, frustration, bitterness, confusion, neediness, shame and guilt, what you have left is a beautiful, multi-faceted diamond of love, with all its facets shining brightly. Moreover, when you are living from the place of clarity, love, compassion, acceptance, and non-judgment, the universe conspires to meet your needs and desires and you are content with whatever shows up in your life. Once you choose to change your perspective, everything life offers you is meaningful and filled with grace. What does grace look like? Grace is a divine and sacred gift from God and is available to everyone. It allows us to release and let go. It’s a gift of mercy, giving us peace. What does this look like in everyday life? It’s simple; I found it recently when I ran into an old acquaintance, a lovely spiritual-based woman in the grocery store! She told me she just lost her job and was wrongfully accused of something. It took some time, but she forgave her accusers and realized how peaceful her life has been since she lost the job. The fact is, she had wanted to quit for some time anyway, but “could not afford to do so.” She now sees the blessing in the firing, and is grateful for the outcome. I know you understand exactly what I am saying here. There are many lenses through which we see, and we all have the choice of which lens to see through. Certainly it hurts to be fired, especially for something you did not do. You can choose the lens of anger, the lens of retaliation, or the lens of the martyr, and no one will blame you. All of those lenses make sense, but none of them will lead to a happy, soul-centered life. Recognizing the grace in all things, the gift of getting what she wanted even though the way it happened is not of her design, takes practice. It takes building your forgiveness muscle to see clearly and accept with grace. Building your forgiveness muscle is about training and practice. In the very same week, I got to see first hand with another friend what training and practicing forgiveness looks like. My friend told me she and her boyfriend were fighting. She went for a walk to take some time before responding to him. During the walk, she realized she could go back and fight it out to prove her point, but she knew what she really wanted to do was to forgive and let it go. She understood in the bigger scheme of things, this argument was unimportant, a thing of the past. So she CHOSE to forgive and live from the place of “this too shall pass!” She felt peaceful, blissful actually, choosing to live in the energy of what she called ACCEPTANCE. She went back home and was able to let go of “being right.” And, she was able to forgive not only him for “hurting her feelings” but herself for blaming, judging, and projecting her pain upon him. It’s natural to want retribution and it’s easy to blame others, which is why practicing forgiveness on a regular basis allows us to release karma, guilt, and shame. When whole communities start treating each other, and themselves, in this way, we see miracles. Our collective stories will change. With oneness, we allow space for this new golden era to enter. In this new era, we wake up from the conscious dream of duality, knowing that we can only see as far as Earth’s duality can take us. We make the choice to leave the drama-trauma behind and choose to see things from a more sacred and higher vantage point. The bottom line is that what we see from the world of duality, from right/wrong or left versus right brain thinking is very limited. 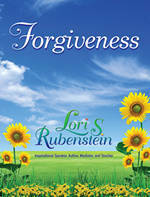 The Living with Forgiveness process taught in this book will help us change how we think and will open us up to possibilities that at this point, are beyond our imagination.